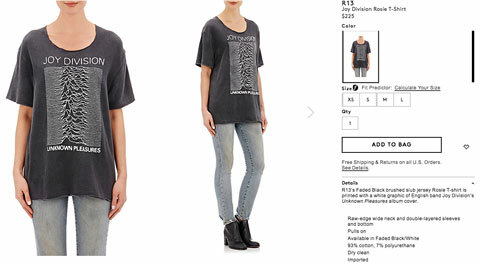 If you're feeling thrifty, you can buy a Joy Division tee for $225 or a Bowie shirt for $175, though. Nothing says punk quite like buying a crisp black band T-shirt for hundreds of dollars, does it? No? 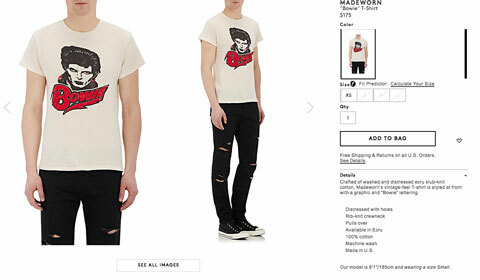 Well, if not, Barneys clearly hasn't got the memo, as they're selling the things for a ridiculous amount of money. 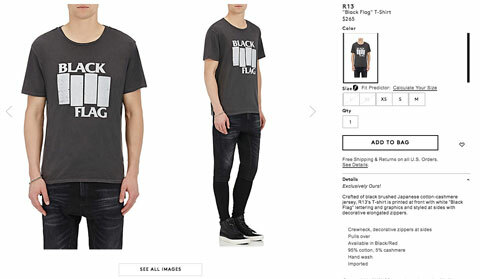 As reported by Digital Music News, the famous US department store are stocking Black Flag T-shirts for a whopping $265, which is just over 200 British pounds. To be fair to them, it's not just any old Black Flag tee. The "exclusive" Madeworn garment is crafted from "black brushed Japanese cotton-cashmere jersey" and is styled at the sides with "decorative elongated zippers". It still manages to look exactly like every other band T-shirt, though. If anti-establishment, non-conformist punk rock doesn't do it for you, then you can always spend your capitalist spoils on Joy Division's famous Unknown Pleasures t-shirt. It will still set you back a ridiculous $225. If you're still feeling a little poor, however, you can get a David Bowie shirt like this one for $175 below. The company are also stocking T-shirts from the likes of Guns N' Roses, Blondie and The Doors for a similar price. Who said rock 'n' roll was dead, eh?